Rush Order includes priority shipping with your order. 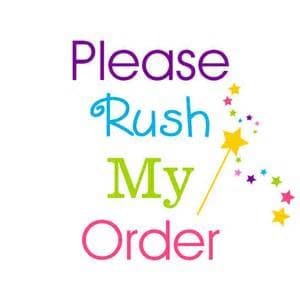 Add RUSH-ORDER upon checkout to move your order to the front of the line ahead of other waiting brides. Your order will be shipped within the time frame of your selected choice. ---Orders are only produced and shipped during business days of Monday-Friday, weekends and holidays are NOT counted in the time frame (unless urgent and you've contacted me). ---Let me know if you want Express shipping (1-2 days) so I could provide you with correct shipping charges. ---Priority shipping for international orders will have a higher cost compared to a standard shipping charge. Let me know if you want priority shipping so I could provide you with correct shipping charges. ---Same Day* Order has to be received by no later than "1 pm Eastern Central Time" for same day shipping and If I have the supplies in stock, the item will ship the same day. If not, it will be shipped the next business day. A Rush-Fee adjustment will be made to the correct amount of time it takes to ship the item. Same day and 1 days service receive 2-day priority shipping at no extra charge.